US Journalist Allan Nairn Freed | Democracy Now! Meanwhile, the first units of an international peacekeeping force landed in East Timor early today to crush a campaign of terror unleashed when residents voted for independence from Indonesia three weeks ago. The first troops to land, shortly after dawn, were a small contingent of Australian special forces and an Australian infantry battalion. They landed without incident and secured the airport. The potential danger in East Timor will come from irregular militias that have terrorized the former Portuguese colony, with the backing of elements of the Indonesian military. As the international force has mobilized, these militias have mostly withdrawn, many heading for havens in the Indonesian province of West Timor. Australia says that their troops will be in East Timor for years. Meanwhile, an American journalist who has criticized Indonesia for its treatment of the East Timorese was deported yesterday, the state news agency Antara said. Allan Nairn, who writes for The Nation magazine, was arrested in the East Timor capital, Dili, while surveying damage by rampaging Indonesian troops and their militia auxiliaries. Immigration officials in Kupang, in the Indonesian province of West Timor, put Nairn on a flight to Singapore, saying he had entered without the correct visa. Nairn, who was beaten when he witnessed a massacre of civilians by Indonesian troops in 1991 in East Timor, has reported extensively on the Indonesian army’s special forces. That unit has been accused by the United Nations and international observers of orchestrating much of the violence unleashed in East Timor over the past two weeks. Nairn was expelled last year after he accused the Pentagon of training the special forces unit in violation of a congressional ban on working with Indonesian forces. Max Watts, with 3CR Community Radio in Melbourne, Australia. American journalist Allan Nairn, who has long criticized Indonesia for its treatment of the East Timorese and also exposed the US government’s support for the Indonesian military, was deported today to Singapore. Allan Nairn writes for The Nation magazine and has been doing almost daily reports for Democracy Now! on the ground from East Timor. He was arrested last week in East Timor by the Indonesian military, interrogated for a number of days, told that he would be prosecuted and face ten years in prison, and then ultimately the Indonesian regime turned around and deported him. In a minute, we’ll go to Allan in Singapore, but first the latest out of East Timor and Australia. The first units of an international peacekeeping force landed in East Timor early today to crush a campaign of terror unleashed by the Indonesian military when the Timorese voted for independence from Indonesia three weeks ago. The first troops to land shortly after dawn were a small contingent of Australian special forces and an Australian infantry battalion. Among the peacekeepers are forces from Australia, New Zealand and Britain, the first in a UN-approved force aiming to impose order in the ravaged country. About 2,500 troops are due on the ground today by late afternoon, the bulk of the 7,500 force expected to follow within a few days. Meanwhile, in Australia, East Timor independence leader, Jose Alexandre, known as Xanana Gusmao, widely expected to be the first president of independent East Timor, was nowhere in sight on the day international troops moved into his homeland. Gusmao’s spokesperson Joao Carrascalao complained that Australian authorities have sequestered Gusmao since his arrival in Darwin this weekend. He called it a bizarre situation. Gusmao was freed from prison just a few weeks ago, after he had served nearly seven years in prison for leading the democracy movement in East Timor. We now go to Australia to talk about the peacekeeping forces and to talk about what’s happening with Xanana Gusmao. Max Watts joins us. He is a reporter with 3CR Community Radio in Melbourne. Very glad to be with you. So, tell us about the peacekeeping force and what is happening in Australia as they head into East Timor. Well, I think you pretty well covered it. The present situation is that the peacekeeping force has begun to land in Dili. We have got reports that they’re supposed to go to Baucau as well. However, most of East Timor remains terra incognita. There are no peacekeepers inland, and the militia and the Indonesian army have still maintained positions in most of East Timor, as does the Falintil, the army of the East Timorese people. Incidentally Gusmao was the commander of the Falintil, rather than of the government at the time when he was captured. He was a military leader of the resistance. And as to him being sequestered, we have had a constant, rather curious behavior in Darwin by the various Australian police units who have barred the activists of the Free Timor movements from accessing the refugees as they have been arriving, and have kept Gusmao, as you said, sequestered. It’s a rather curious position, but one wonders what gain those elements in the Australian government, which, of course, for twenty-four years supported the dictatorship in Indonesia, are playing. I think one of the things we should remember is that the Australian government has a very, very unsavory record concerning East Timor, and we should also remember that the Timorese fought on the side of Australia against the Japanese and suffered enormously for that activity during the anti-Japanese war in 1942 and ’43. So, perhaps there is — we still don’t quite know how the Australian government intends to handle the East Timorese situation. The danger exists that they are going to try and maintain a certain form of law and order using at least elements of the Indonesian military to do this. It’s a very complex situation. The picture we have on the front page of the newspaper yesterday is a picture of the head of the Australian armed forces that are coming into East Timor, General Cosgrove, and the general of Indonesia who’s in charge of martial law in East Timor, General Kiki Syahnakri. Yes, not only — that picture is, of course, quite logical, because Major General Cosgrove’s first problem is to get his troops ashore with the least amount of hassles. And it’s quite logical that as the Indonesian army still controls the airport and the ports, that he is doing his best to — let’s at least put it this way — neutralize them or put them on side. What is, however, rather curious is the lack of contact, as far as I have been able to ascertain, between the Australian United Nations forces and Falintil. In other words, the obvious thing that they should have done, what seems to be logical, is to drop at least radios and perhaps small airborne units into the various guerrilla units. And they have not done this. To the best of my knowledge, communications with the Falintil guerrillas in the mountains remain extremely patchy and are more due to individual Falintil commanders and occasionally to journalists, such as Allan Nairn previously was doing and Max Stahl is doing, than any organized Australian coordination with these guerrillas. And the same thing we can say is happening in Darwin, where we have real problems in maintaining communications between the incoming refugees and the well-established Australian support network, Australian and Timorese. General Wiranto in Indonesia dismissed reports today that thousands may have died in East Timor over the last few weeks, saying the number is more like in the nineties. Max Watts? I think we can consider General Wiranto’s figures as exactly what they are. They’re [inaudible] statements. From Suai alone, one town in the south of East Timor, we have somewhere between 100 and 200 people killed in one particular incident in one or two hours on Saturday morning of the 4th of September. The moment there — from Becora, I — and Becora is a suburb of Dili — on one particular evening, Saturday evening — no, I’m sorry, Thursday evening, before the results were known even, there were seventy-eight people counted killed in that one particular suburb. The total figures are certainly in the thousands, many thousands. It will be hard to know how many thousands. And then, of course, we should add to these figures the people who have been dying and are still dying right now of hunger and thirst in the mountains, where they were driven by the militia. We’re going to go from Australia with Max Watts of 3CR Radio, 3 Community Radio in Melbourne, to Singapore, where journalist Allan Nairn just arrived a few hours ago, deported from East Timor to West Timor, then moved from West Timor to Bali, Jakarta, and now finally out to Singapore, after being told that he would be prosecuted and face ten years in prison for entering the country despite a military ban, a military ban because he survived and reported on and condemned the Dili massacre of 1991, in which his head was fractured by US M-16s held by Indonesian soldiers, and more than 250 Timorese were killed that day, as well. Allan, how did this turnabout take place, from the course of going to trial to being deported? Well, your listeners probably know better than I do. I think there was a lot of outside pressure. And the local immigration chief, who was dealing with me in those final days, said from the start that the decision would be in the hands of General Wiranto and that this is being handled in Jakarta by the military intelligence headquarters and that various ministers were debating it. They said Maladi, the attorney general, was probably saying from the start that I should just be tossed out. He’s the same one, Maladi, who had pushed all along for an early release of Xanana. But others were saying, “Go ahead with the jailing.” But I guess they got enough pressure in the end. They figured it just wasn’t worth it politically. You know, if I had been Indonesian or Timorese, this wouldn’t even have been an issue. I probably wouldn’t have made it out of the Koram military headquarters in Dili in one piece. But, you know, because — as happened with us at the cemetery at Santa Cruz, because I came from the same country where the weapons come from and the ammo and the trainers, I got some special treatment, so therefore I’m here. I want to let our listeners know that we know that, well, hundreds, if not thousands, of calls came in from around the country to Congress members and senators, with letters demanding that Allan be released, to Madeleine Albright, top meetings that dealt both with the situation in Timor and with Allan’s situation, tremendous pressure on the US embassy in Jakarta, as well as the immigration center right where he was being held in for a few days in Kupang, the capital of West Timor. Allan, that kind of pressure on the US government — I thought it was interesting to hear how things were phrased. It was almost as if people were saying to Madeleine Albright, the US Secretary of State, “Release Allan now,” as opposed to the Indonesian government. What about this connection? Well, the US obviously has tremendous leverage over Jakarta. I’m glad that I’m free, as apposed to spending ten years in jail, but I’d much rather that East Timor had been freed a long time ago and that Indonesia had been freed. You know, the US makes a business of publicly downplaying the influence it has over its client armies. If you just leaf back through the old New York Times or Washington Post clippings, you can make a stack three feet high of all the pieces quoting unnamed military analysts lamenting the fact that the US has so little influence over the behavior of the Salvadoran army and so little influence over the behavior of the Guatemalan army and so little influence over the behavior of the Haitian army and so little influence over the behavior of the Indonesian army, when, in fact, if you take a close look at how officers are trained and chosen and promoted, how these countries acquire their weapons systems, how they come up with their intelligence and their counterinsurgency doctrine, how they make their key decisions, it’s just a fact — it’s just obvious to anyone who knows and is honest — that Washington is calling many of the shots. And this — you know, what happened recently in Timor is just the latest outrage. I mean, it is so unspeakable, it is so unbelievable, that after just a few weeks ago being a place where people were out in the streets celebrating their impending freedom, you know, this amazing outpour from the Timorese at the end of the electoral campaign, and then the astonishing voter turnout, 98 percent — you don’t see that anywhere in the world — and then, after that, Dili is destroyed. The place is burnt down, looted, laid waste. And in the countryside, they go around snatching people from their homes, dragging them off by plane and boats and truck to Atambua and Kupang and God knows where, singling out some of the particular independence leaders for execution, when they have them there in the helpless refugee state. Clinton could never bring himself to say that, and so this carnage occurred. Allan, we have to break for stations to identify themselves, but we’ll be back with you and Max Watts in Australia and hear if this discussion is taking place in Australia, as well. This is in the US Congress and I know in Britain, as well, tremendous debate over the arming of Indonesia — for the first time, this entering the mainstream discussion here in the United States, whether military training aid should be cut off and the flow of weapons, as well, on a more permanent basis to the Indonesian regime. Allan Nairn, joining us, just deported to Singapore by the Indonesian regime. Max Watt is with us from 3CR Radio in Melbourne, Australia, community radio in Australia. 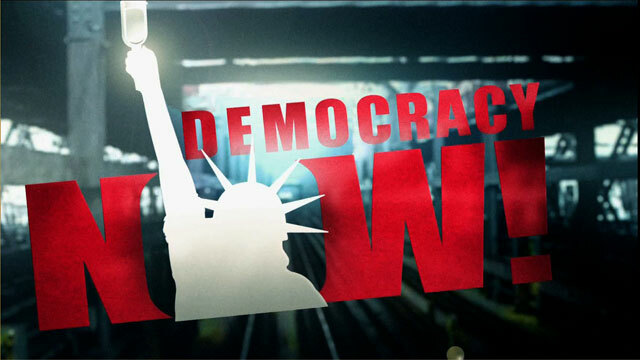 You’re listening to Pacifica Radio’s Democracy Now! We’ll be back in a minute. On this day that the Australian-led peacekeeping force enters East Timor, Xanana Gusmao, the rebel leader of East Timor, released several weeks ago after years in prison by the Indonesian regime, first took refuge in the British embassy in Jakarta so that he wouldn’t be killed, now headed to Darwin. He is there now, but a lot of people don’t see him and are wondering what’s happened. Reminds me a little of when Jean-Bertrand Aristide, the Haitian president, was brought back to Haiti after the coup in a US military jet, and after he got there, very few people saw him for the first year, as if he was a prisoner in the palace, and the US and other Western countries forced on Haiti an International Monetary Fund/World Bank plan that it seems to have devastated the country. Max Watts, on that point, why can’t Xanana Gusmao just step out? And who are the forces that seem to be — I don’t want to say “holding” him, but, what is it, protecting him? Well, we’ve been asking ourselves that question. I doubt very much that they’ll be able to hold him much longer. And as a matter of fact, just before you called me, I was going to try and find out the latest from Darwin, whether he has been able to speak to his friends there. The system that the Australian government has used on the refugees, or the — whatever we want to call them — the people being brought in from Dili, is to tell them that if they don’t do what they’re told, they will get no further relief supplies, no funds, and quite a few people have been shipped from Darwin down to Victoria, a long way — it’s like being sent from Texas to Vermont — and they were sent on simply with the question that if you don’t go, if you don’t do as we are asking you to do — not telling you, but asking you very firmly — then you will get no further funds. Now the Australian situation is not one in which these people can be kept incommunicado, out of touch, for more than a few hours or days. I think by tomorrow or the day after, there will be communications, at least with Xanana. I was going to ask Allan, now that I have him at the end of a line — I suppose you can hear me, Allan Nairn? One question that we’ve been asking ourselves: why did Wiranto and co. allow the elections to go ahead, in your opinion? Why was there complete calm? And I’ve had some very graphic descriptions of how the militia had their weapons called in in Ainaro and other places, and where they actually had the weapons handed in at the police station, and then they were reissued a day later. 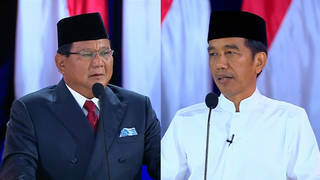 So, how come that the Indonesian army allowed — Wiranto and company allowed the elections to go ahead peacefully on the 30th of August? What is your opinion on that? I think, from the start, Wiranto and the top military commanders had realized that they had lost Timor, that they can’t hold onto Timor. That has been the case since Habibie caught the military a bit off guard by making the initial confession that independence would be considered and the election could be held. There have been so much international pressure around the holding of the elections that I think Wiranto feared that if they tried to actually stop the vote, they would suffer real cuts, that that would be seen as such a violation of international political standards that the US and Britain and Australia and the IMF would have to move from words to action, and the TNI would lose some actual money and trading and weaponry. But I think he also calculated — and it turns out I think he calculated correctly — that if they allowed the elections to go forward but just continued with the militia terror, the only price they would pay would be a verbal admonition from Washington, but that wouldn’t stop the flow of ammunition and IMF money and many other things. A Western military person in Timor who I’ve been speaking to over the past few weeks who’s very familiar with the Indonesian army — he actually has trained the Kopassus many times himself in commando tactics — he had what I thought was a very accurate analysis of what Wiranto was up to. He said, “He’s engaged in brinkmanship. He’s taking it right to the limit, getting away with as much as he can get away with. But the moment he thinks that the TNI will suffer concrete losses in terms of international, vital international support, then he’ll pull back. And he always pulls back from the brink, but will only pull back unless there is the prospect of real losses.” So it would have been too much to shut down the elections, but it wasn’t too much to burn down Dili and kill untold numbers of people. I see. Well, I got a worm’s eye view of people who saw this in Suai at the church and elsewhere, and you were seeing a much more broader picture from Dili. The people I spoke to were in a few places like Baucau, Dili, Ainaro, and you. And I was sitting here comfortably. Incidentally, I’m not in Melbourne; I’m sitting in Sydney. I just covered Melbourne from here. Well, I think a lot of the local militia people did have unrealistic hopes that they could win the election or stop the election, but they’re not the ones who call the shots. The local militia leaders are people who have been on the Indonesian military intelligence payroll for decades. Some of them are street criminals who are being used by the TNI. And, you know, the TNI uses them fairly ruthlessly. They take advantage of their own worries about them losing their status in a new free East Timor, and they send them out to kill their neighbors. You know, those people probably had all sorts of aspirations. Allan Nairn and Max Watts, we only have a moment, and I want to follow up on two quick questions. One is the issue of the Australian Defense Minister John Moore saying he expects the UN force to be in Timor for years to come, and I’m wondering if you’re concerned about, for example, whether it’s going to shape the country of East Timor more than the people of Timor will. And also, with Australia leading it, where does that leave, for example, the oil in the Timor Gap that Australia and Indonesia have signed a treaty around, stealing it from the Timorese? That’s one question. And then, Allan Nairn, I wanted to ask you, following up on your point that Clinton could have stopped the violence if he had just done this two weeks ago, I wanted to follow up on that point. But what about this first one, Australia controlling the peacekeeping forces and having a tremendous vested economic interest in the resources of Timor? This is going to be a hot potato for any Australian government, because they are going to have to try and raise a lot more money. The Australian military is not as well funded as the American. And as its present budget would not allow it to permanently keep a large amount of soldiers in Timor, now we’re hearing this all along now, Australia has got to change its entire defense policies. We are going to have to spend a great deal more money on the military, and all these promised tax cuts that have been the line of the Howard government, the conservative government, which has promised to cut taxes, particularly for business, are going to be endangered. Now, there will be a considerable resistance to this kind of policy in Australia. And, of course, there’s also a great deal of feeling for the rank-and-file Timorese people here because of the wartime association. And one last thing, we are also going to have to revise our policies towards the Indonesian people. There will be greater contact on a people-to-people basis. Somebody made a very good point. There’s business-to-business, b-b contact. There’s g-g contact, government-to-government, with Indonesia. But we also have, of course, in Australia p-p, people-to-people contact with the Indonesian people, who are not going to sit by quietly and watch things — the generals try and take power back, which they obviously are going to try. Allan, on the point of oil and Australia’s interest in it, and Clinton having a lot more control over the violence in Timor than any newspaper puts out? Well, the — it’s interesting. Even the US has all along made it very clear that they intend to prop up the TNI, the Indonesian military, maintain them as the central power in Indonesian politics, even though the US clearly prefers a civilian as president. But on Timor itself, all through the years and even now, I think it’s been pretty clear that the American Pentagon and State Department, they really would rather not deal with Timor. Australia, on the other hand, in recent months seems to have made a shift, where they’re looking to wield tremendous influence in Timor. They see political gains in that. And with the huge Australian presence in this peacekeeping force, I think it is a major danger for Timorese politics. The Haiti analogy is one that the Timorese really have to keep an eye on. It turned out to be a political catastrophe for Haiti, when Aristide came back in the US helicopter and found himself, really allowed himself, to be a political captive in the final year of his restored presidency. Now, the Timor situation is not as bad as Haiti was, because when Aristide was brought back, he already had — under duress, with a gun to his head, he had already given away the store. He had already agreed to the World Bank/IMF economic plan. He had already agreed to the military occupation, this under the pressure of the FRAP and the Haitian military killing off his supporters on the ground. Xanana hasn’t made deals like that yet. But in the end, the fact that Aristide allowed himself to be isolated from his popular base and did not attempt to modify and revise those deals he had made with Washington, it was his own fault in the end. And if Xanana allows himself to be isolated, it will be his own fault, too. I hope he doesn’t — I hope he doesn’t fall into that — fall into that trap. You know, there’s so much that’s happening with Timor now so quickly, it’s almost hard to get your mind around it. I mean, we have the outrage of the recent army militia terror. But then there’s also — this is basically a tremendous victory. The Timorese have won. There may still be some more bloodshed, but it’s basically over. The Timorese people have defeated the armed forces in Indonesia. If accurate history is written in the future, they will look back at this as a very big one, I mean, an astonishing victory for popular forces and also international activism against horrible repression backed up by the might of Washington. It’s really something. But at the same time, you also have fast-approaching dangers, things like these armed peacekeepers roaming around, suddenly being a huge new factor in Timorese political life. So it’s going to be a lot to deal with, and the Timorese and people internationally who are concerned with the situation are going to have to be very alert. As to the US, the answer is the same as it’s always been: cut off all support for the Indonesian military. Timor is basically a done deal now. The Timorese won; the Indonesian army lost. But Indonesia is still very much in contest. That army still has its police state throughout Indonesia. There’s a democratic upsurge that is challenging the power of the army, and it’s still not clear who’s going to win. It could go either way. If, however, the US completely cuts that military off now and the second-level backers like Britain and Australia follow suit, it will be a tremendous blow to Wiranto and his army, and it will really improve the prospects of the grassroots pro-democracy forces throughout Indonesia. On that note, we have to break for stations to identify themselves and wrap up this discussion. Tomorrow, we will take on the issue of the weapons flow to Indonesia. Our latest news, though we have to confirm these reports, that while President Clinton announced the cutoff of military weapons sales, that the weapons that were in the pipeline now, and we’re talking in the range of hundreds of millions of dollars worth, are continuing to go to Indonesia. Allan Nairn, joining us from Singapore, the US journalist who was one of the last to remain on the ground in East Timor when the mass of international press left. He was arrested by the Indonesian military. He was threatened with a trial, faced ten years in prison, but was just deported a few hours ago to Singapore. Max Watts, on the line with us from Sydney, Australia, where he’s with 3CR Radio, 3 Community Radio, talking about the Australian-led peacekeeping force that’s entered East Timor today.